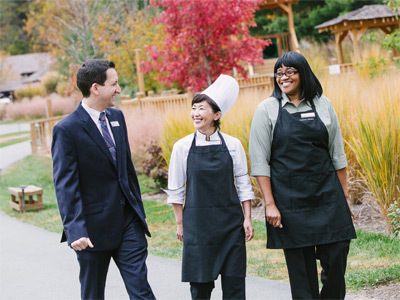 Biltmore is interested in people who strive for excellence; who are committed to working together, supporting each other, and sharing a sense of stewardship to protect this special place. Our employees shape and enrich extraordinary experiences for guests, using judgment and skills based on our Vanderbilt-inspired legacy of hospitality. We invite you to join our dedicated team. Apply for jobs online or visit the Biltmore Career Center®. For general inquiries, submit an online request or call us at 828-225-6122. An offer of employment is conditional upon the result of a security background check, reference checks, and—for certain positions—a drug screen, a physical examination, credit report, and/or driving record report prior to the commencement of employment.